The I-7188EG is an embedded controller and powered by an 80188-40 processor with 512K bytes of static RAM, and 512K bytes of Flash memory. It provides one serial RS-232 port, one RS-485 port and one 10BASE-T port. Each I-7188EG has an Ethernet port and can take your system to the internet world. The I-7188EG also supports an optional battery back-up SRAM expansion board and Flash-Rom board, providing non-volatile mass storage from 2 megabytes to 64 megabytes. The I-7188EG controller can be a Modbus "Slave" and/or a Modbus "Master" controller depending on the application. As a Modbus slave, you can use COM1 (RS232) and the Ethernet port of the I-7188EG controller to link to PCs or other HMI products. As a Modbus master, you can use COM2 (RS485) to talk to other PLCs or devices which support Modbus protocol. The I-7188EG has an I/O expansion bus which can plug an expansion I/O board. Available I/O boards are as X107, X202, X203, X303, X304, X305, X503, X504, X505, X506, X507, X508, X509, X510 and more. The I-7188EG controller can use its COM2 (RS485) port to link to ICP DAS's "I-7000" & “I-87xx” series ( Note1) of remote I/O modules. This configuration can be very useful in applications that require distributed remote I/O throughout the system. The COM1 (RS-232) port of the I-7188EG controller can be used to interface with additional Man Machine Interface (MMI) devices such as touch screen displays. ICP DAS provides a full line of touch screen displays, such as the "Touch" series screens. 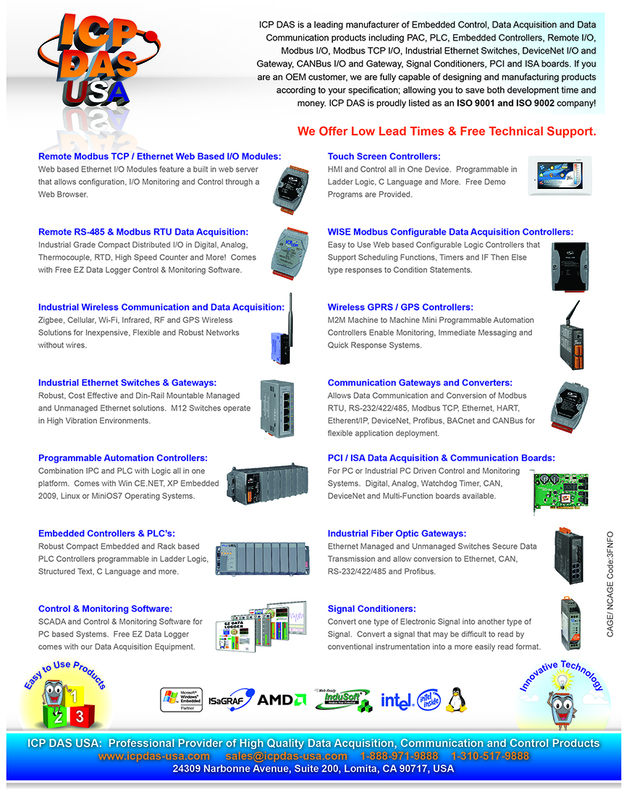 The models in the product line include the Touch 506, and the Touch 510 MMI products. Like the I-8437 / 8837 controllers, the I-7188EG can use its Ethernet port to talk to one aother via the Ebus (Ethernet network) software communication mechanism. Each I-7188EG has an IP address and with a fixed port No. of 502. 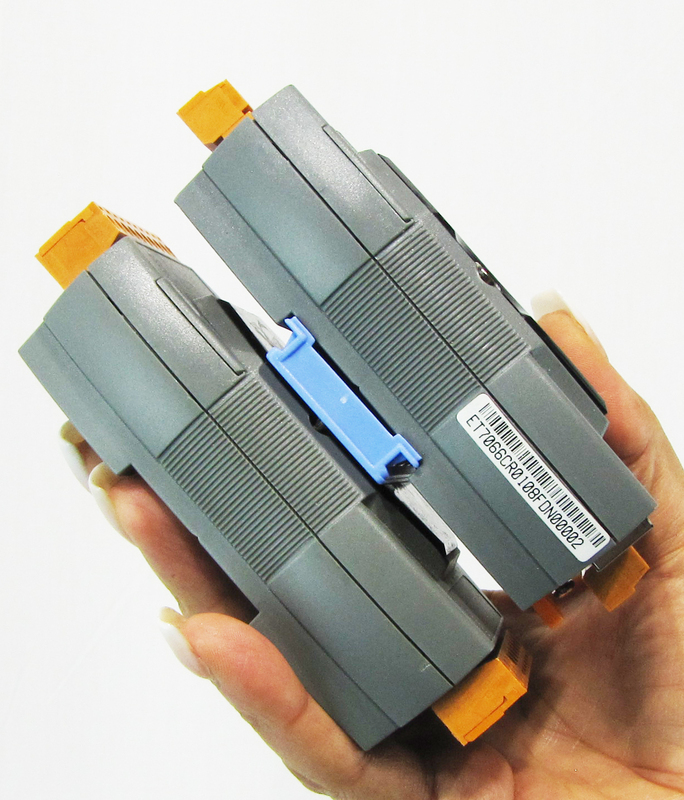 With Modbus TCP/IP protocol, up to 4 PCs can link to one I-7188EG through Ethernet. With Modbus serial protocol, another PC or MMI can link to the COM1 (RS232) port of the I-7188EG. Therefore, the maximum number of clients that can be linked is 5. The I-8417/8817/8437/8837 & I-7188EG/XG support the ICP DAS's MMICON to become their Man Machine Interface. The MMICON is featured with a 240 x 64 dot LCD and a 4 x 4 Keyboard. User can use it to display picture, string, integer, float, and input a character, string, integer and float. All control logic is written in ISaGRAF program. 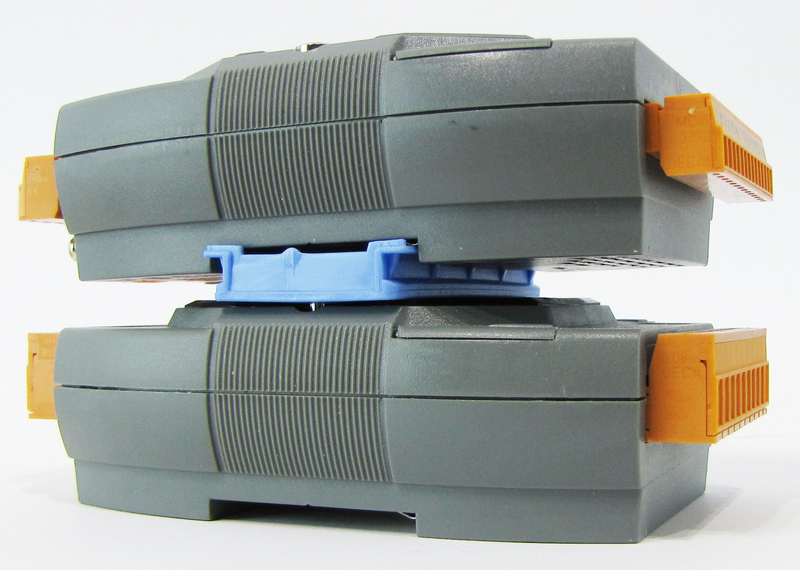 data, date & time can be stored at X607 / X608, and then PC can load these data via RS232/RS485. Parallel D/O boards can do PWM output. Up to 8 channels for one controller. 500 Hz max. for Off=1ms & On=1ms. Available output square curve: Off = 1 to 32767 ms, On = 1 to 32767 ms. Parallel D/I board at slot 0 can accept counter input up to 500Hz with minimum pulse width > 1ms. Up to 8 channel for one controller. Counter value: 32 bit. Two ISaGRAF controllers can link to remote I-7000 & I-87K I/O modules at the same time. Only one controller is active to control these remote I/Os. If one is dead, the other one will take over the control of remote I/Os. The I-8417/8817/8437/8837, I-7188EG, I-7188XG & Wincon-8037/8337/8737 controller can integrate with a GSM Modem to support SMS: Short Message Service. This allows user to request information or control something from his own cellular phone to the ISaGRAF controller. Beside, the controller can also send information and alarms to user's cellular phone . Disply for I-7188EGD Five 7-Seg. Led on the front. lt can display message & value. Expansion I/O bus One optional Xxxx series I/O board can be plugged inside the I-7188EG / 7188EGD. COM1 RS232 TXD,RXD,GND Speed: 115200 bps max. Program download port. COM2 RS485: D+, D-, 115200 bps max. Self-tuner ASIC inside, Program download port. Ethernet 10M bps, NE2000 compatible, 10 BaseT, Program download port. Pulse Width Modulation output All Xxxx series D/O boards support PWM output. 8 channels max. for one controller. Parallel D/I counter All Xxxx series D/I boards support D/I counter. Modbus serial protocol COM1 default supports Modbus RTU slave protocol for connecting ISaGRAF, PC/HMI/OPC Server & MMI panels. Modbus TCP/IP protocol Ethernet prot supports Modbus TCP/IP slave protocol for connecting ISaGRAF & PC/HMI. Fbus built in COM2 port to exchange data between ICP DAS's ISaGRAF controllers. SMS: Short Message Servise One of (COM3:RS232 or COM4:RS232 if found) can link to a GSM modem to support SMS. User can request data/control the controller by cellular phone. The controller can also send data & alarms to user's cellular phone. User defined protocol User can write his own protocol applied at COM1, COM2 & (COM3 to COM8 if found) by serial communication function blocks. 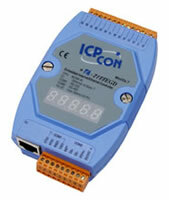 MMICON / LCD One of (COM3:RS232 if fonnd) supports ICP DAS's MMICON. The MMICON is featured with a 240 x 64 dot LCD and a 4 x 4 Keyboard. User can use it to display picture, string, integer, float, and input a character, string, integer and float. Redundant Bus7000 Two ISaGRAF controllers can link to remote I-7000 & I-87K I/O modules at the same time. Only one controller is active to control these remote I/Os. If one is dead, the other one will take over the control of remote I/Os. I-7188EG / 7188EGD can support up to 1024 retain variables with a X607 / X608 plug in the only expansion I/O slot. Data can be stored in X607/X608, and then PC can load these data via COM1or ethernet. PC can also download pre-defined data to the X607/X608.